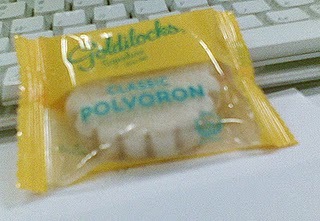 This is the Goldilocks 'Signature' CLASSIC POLVORON. The last Polveron that Marco's brother broght back from the Phillipines. For thos that are not initiated in the delights of the classic polveron – it is kinda like a raw sweet shortbread mixure – not cooked – on no, that would be too obvious. Instead it is compressed at 1000 psi so that it disintegrates on the tongue into mouth glue. Yum. This is the last one we will see for a bit.